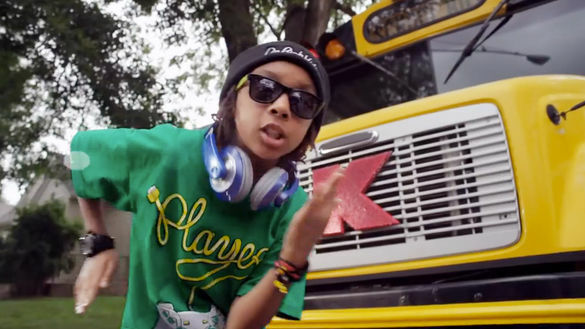 Ben 10 of Da Rich Kidzz in front of the Kmart bus. Looks like north Minneapolis’s pint-sized rap stars of “Hot Cheetos & Takis” fame are finally seeing some sizable payoff for their giant success, courtesy of Kmart. As was reported last year, parents of the “Hot Cheetos” hitmakers complained that their kids never saw any of the money made off of paid downloads of the single and YouTube ad revenue from the video (now at 7 million views), all of which originated as part of the Northside YMCA’s Beats & Rhymes after-school program. That’s when the “Hot Cheetos” stars dropped the original Y.N.Rich Kids name and started performing and recording under new management. Melissa Mercedes, the mom of Freeman “Frizzy Free” Hickman, was happy to confirm that the group is seeing by far its biggest payday yet from the Kmart campaign. “They made out all right in this deal, yes, and we’ll be putting it away in those college funds,” she beamed. But she also echoed the statement that they earned it, noting that production for the Kmart commercial ate up two weeks of their time. The parents and Kidzz also hope the ad campaign will pay off by furthering their own original music careers. “I’m already getting calls from as far away as Florida, Alabama and Detroit saying, ‘We saw the commercial!’” Mercedes said. Once again, the Kidzz should have plenty to talk about as they head back to school and report on how they spent their summer vacations.